Adjacent to the beach, Normans Bay site is a haven for walkers and nature lovers. On the East Sussex coast, our Normans Bay Club campsite is perfect for family camping holidays. Opposite is a sand and shingle beach - ideal for sandcastles, kite flying and bathing. The popular seaside resorts of Eastbourne and Brighton are to the west and Bexhill-on-Sea to the east. This open and level site has 200 pitches and three amenity blocks. Facilities include washing machines, a parent and child room, children’s play area and recreation hall. There is also a well-stocked site shop. The nearby Pevensey Levels, known for nature conservation and agriculture, will satisfy nature lovers. 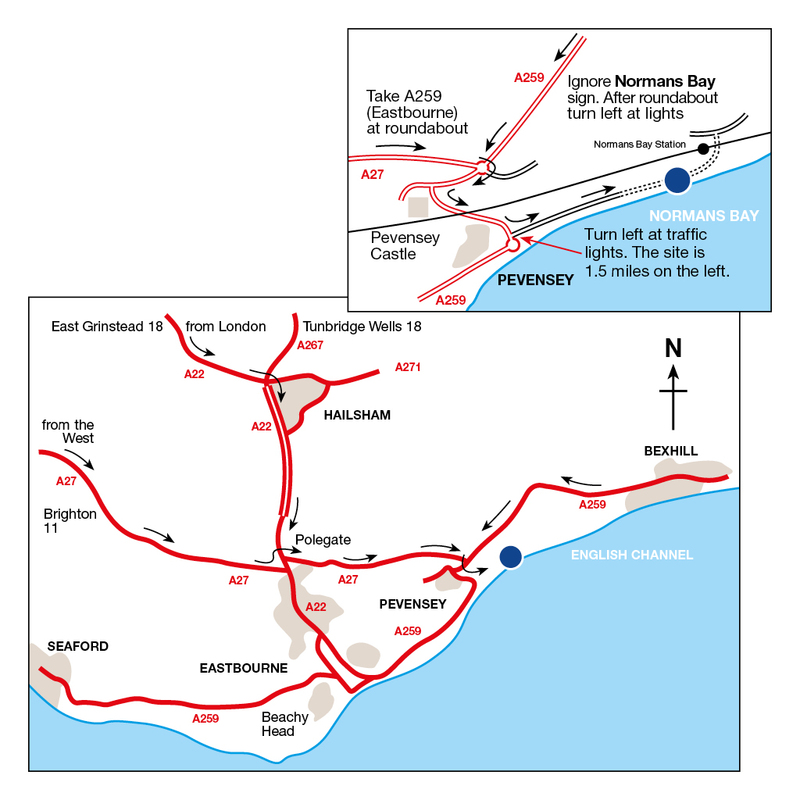 For walkers, the South Downs Way (pick it up at the Seven Sisters Country Park) is a great way to see the stunning East Sussex countryside. The area is steeped in history, the Normans landed here in 1066. Join the 1066 Way which takes you around Battle, Hastings and Pevensey Castle, one of Britain’s oldest strongholds, to discover some of this history. Eastbourne, five miles south west of the campsite, offers a plethora of things to see and do. There are parks and gardens, the Sovereign Marina with a host of shops, craft outlets and eating places and several beaches offering safe bathing and a variety of water-based activities. Other attractions in the area include the magnificent moated Herstmonceux Castle, Drusillas Park and Charleston Manor. The site is next to a dog-friendly beach, where fishing is available. Well-stocked site shop sells a range of food as well as bottled gas. No ball games, kite flying or frisbees are allowed on site. These can be played on the beach opposite the site. There is a farmers’ market in Pevensey Bay every other Saturday. The Smugglers Pub in Pevensey uses local produce and is dog friendly. Campers can also get 10% off their meal. Clinging stubbornly to what was once a peninsula on the Sussex coast, Pevensey Castle is an ancient site that was first fortified by the Romans in the 4th century and later became the landing place for William the Conqueror in 1066. One of the country’s earliest examples of a brick built building, Herstmonceux castle is a 300 acre estate including woodland, formal themed gardens and a 15th century moated castle. Stretching from Winchester, across Sussex to Eastbourne, the South Downs National Park is teeming with bustling market towns, green rolling hills and spectacular views of the coastline. The Battle of Hastings battlefield is a fascinating day out. Wander the battlefield that the Normans defeated the English on and explore the abbey that William the Conqueror built as amend for the bloodshed. Camp at our secluded site in Kent, the Garden of England.